Create a brand from scratch that felt "fresh" and tied in with MaryLee Sachs' book "The Changing MO of the CMO" — about to be launched at Cannes. We created a brand identity that could grow and evolve with MaryLee's needs and ever-expanding vision. The first ask was a business card / book mark that MaryLee used to promote her book and network at Cannes. The Changing MO consultancy group was formed two years later. The new business launch coincided with MaryLee's second Cannes book launch "What the New Breed of CMOs Know". 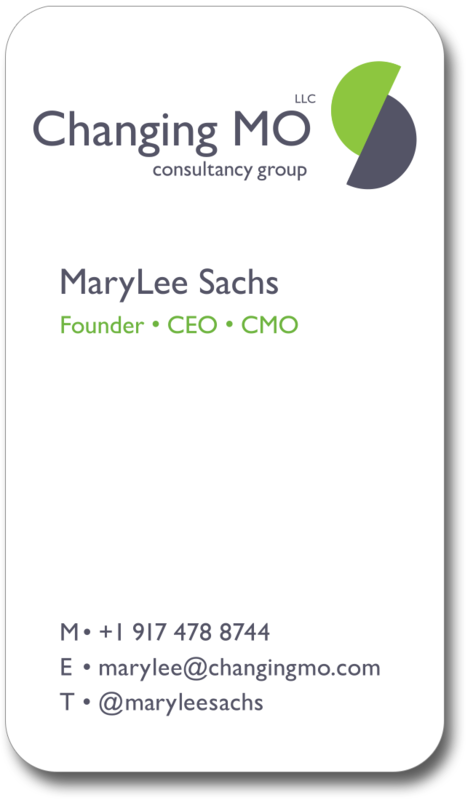 MaryLee continues to be a successful marketer, speaker, Forbes author and Cannes regular. Go MaryLee!